Cheaper Audi A3 launched | What Car? 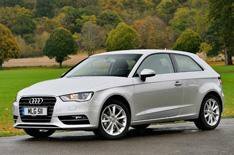 The Audi A3 range is now cheaper to get into with the launch of a new entry-level 1.2 TFSI version. The 1.2-litre petrol unit produces 104bhp the same as the 1.6 TDI engine and drives the A3 from 0-62mph in 10.3 seconds. Power is delivered through the standard six-speed manual transmission or optional seven-speed S tronic semi-automatic gearbox. Claimed average economy is 57.6mpg with either gearbox, while the manual version emits 114g/km of CO2, with the auto at 112g/km. The A3 1.2 TFSI is available in three trims: SE, Sport and S line. Standard equipment includes air-conditioning, Bluetooth, iPod connectivity and alloy wheels. Dealers are taking orders for the three-door hatchback version now, with the first deliveries in May. The five-door A3 1.2 TFSI Sportback will be available to order later in the summer. Prices for the three door start at 17,905 while the Sportback is expected to start at around 18,500.